My knowledge on Scandinavian cuisine, particularly Finnish cuisine, is pretty much limited to what I have watched occasionally on television. What came to mind immediately is “New Scandinavian Cooking” which I have caught on Asian Food Channel (AFC) just recently. So, when I was invited for a media event featuring none other than the American-Finnish cooking sensation, Sara La Fountain, naturally I seized the opportunity. 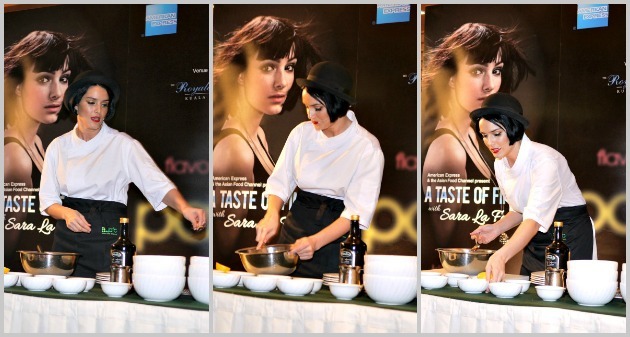 Jointly presented by American Express and AFC, this was the 4th edition of the Celebrity Chef Series. Previous installments of this series were hosted by renowned chefs like Chuck Hughes, Adrian Richardson and Mark McEwan. This time round, from 28-29 May 2012, Chef Sara La Fountain played host to a series of dining-related experiences as part of the tour “A Taste of Finland with Sara La Fountain”. Although born in California, the gorgeous chef holds Finland very close to her heart, having grown up in that Scandinavian country. “Gorgeous” doesn’t even begin to describe her. I had a hard time picking out photos of her from my folder – she looks divine in every angle! Taking “photogenic” aside, Sara is also a very entertaining host, regaling the audience with stories and quips of her life. Her Finnish grandmother plays a big influencing role instilling the love of food and cooking in her. At barely 4 years of age, Sara has already cultivated a love for oysters! Happy memories for her are the summer days spent in Finland picking baskets of wild mushrooms and blue berries (at grandma’s insistence!) which eventually made their way into her grandmother’s cooking pot. 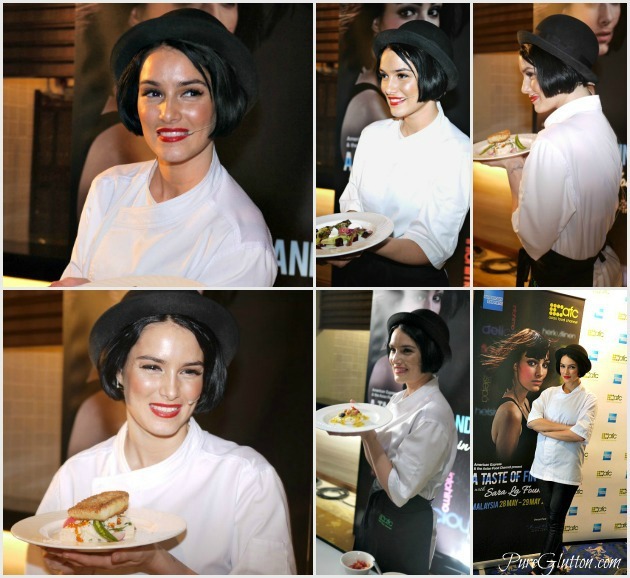 Looking every inch the glamorous tv personality, clad in skin-tight black jeans, white chef tunic and a stylish beret, Sara breezed into the room in Royale Chulan Kuala Lumpur and proceeded to prepare 3 dishes for us. The salad, which she cheekily called it “Sara’s Finnish Forest Salad” is a kaleidoscope of colors, with beetroot, sweet bread croutons, marinated red onions, leafy greens and berries. 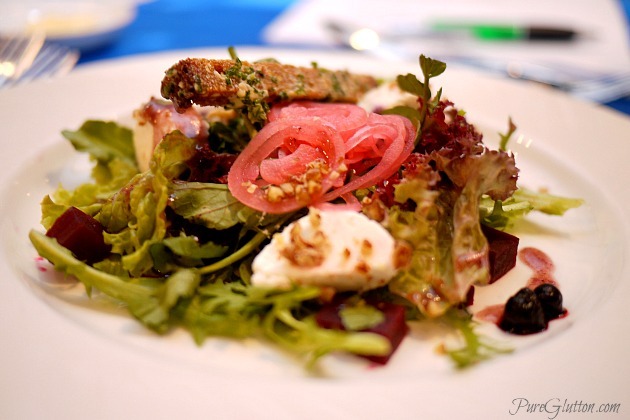 The salad is flavoured with chunks of goat cheese and a blueberry-Balsamic vinaigrette. Very simple and refreshing. It’s kinda like tasting summer on a plate. 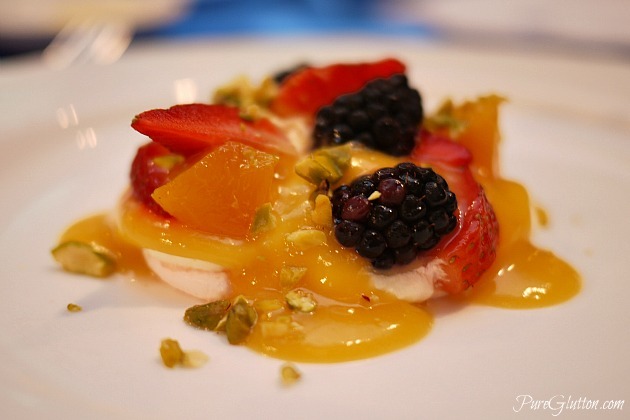 In fact, the “summer” theme is repeated in the main course and dessert: Fried Fish with Summer Potato Salad and Summer Pavlova with Passionfruit Cream with Strawberries and Pistachios. 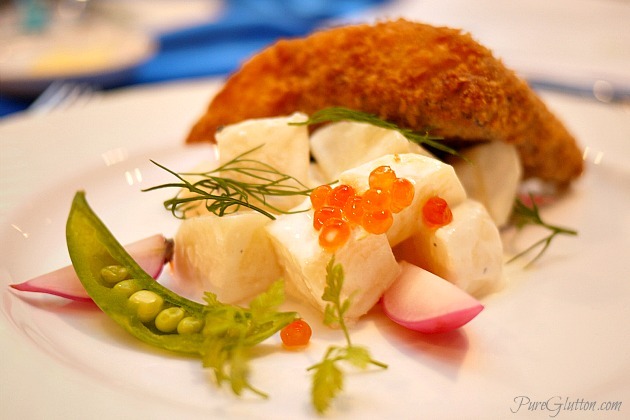 I find the taste of Finnish food to be simple, refreshing and everything is lightly flavoured so as to enhance the natural sweetness of the fresh ingredients used. Nothing is overwhelming and they are visually appealing. Of course the chef made everything look so easy. Plating and food presentation are vital, in Sara’s books. The shapes, colors and positioning of every item on the plate is done with clockwork precision. “I love decorating my food, it’s like creating an artpiece on the plate, you know”, explained Sara as her fingers worked deftly in arranging the vegetables and cheese on the plate. Sara is the epitome of brains + beauty and wears many hats: fashion model, cookbook author, food columnist, designer, food stylist, culinary instructor, television personality and chef. She even has her own catering service. Trained in The Culinary Institute of America, New York, Sara is certainly well-equipped with the necessary skills but it is her passion for food and art that has embellished her firmly in the culinary world. If you flip through Sara’s 2nd cookbook “Passion for Food” which focuses on food that’s easy to prepare and influenced by the different seasons in Finland, you will see that every dish is meticulously executed by marrying fresh ingredients with artistic presentations. 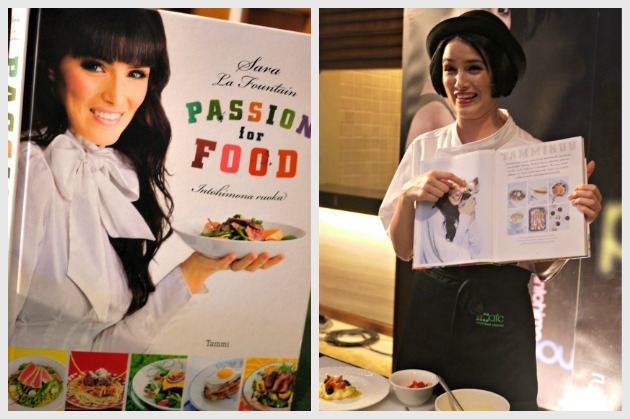 Her first cookbook “A La Sara” earned her the prestigious Gourmand World Cookbook Award in the “Best First Cookbook” category in Kuala Lumpur in 2006. Juggling her time between her tv shows “A Perfect Day” and “New Scandinavian Cooking” which are airing on AFC, writing food columns for several Finnish newspapers and magazines, running her catering service and cooking school, Sara enjoys designing crockery, kitchen textiles, bed linen and kitchen shoes for various companies. One wonders where she gets all that energy and inspiration from! “It’s food and anything that has to do with food… that’s where my passion lies” Sara enthused. “And when you have passion, ultimately you will find the time and the drive” – wise words indeed. When asked what she thinks are the attributes that make a successful chef, she has this say “Live life to the fullest, have big goals, be driven, be bold and always give your own spin to everything! Oh, don’t forget to have some spice in your life, too!” she winked. Keep up with Sara at her blog “Passion for Fashion & Food”. Just look – every angle of Sara is perfect! Starting 2 July 2012, the strip of “A Perfect Day” and “New Scandinavian Cooking” will air again on the Asian Food Channel (Astro 703) Mondays to Fridays at 7.30pm. Ya lor, she doesn’t have ANY bad angle at all! She’s pretty and looks very much like her poster! I mean we have seen quite a few of the chefs who looked different from the marketing materials that greet us.